One of the most awesome things about shooting at home is that you get to eat what you shoot and eat what you want! There is nothing wrong with catering, BUT it can get a bit old and repetative eating the same thing day in and day out at a studio. So when I shoot at home, I am all about eating simply. This was today's shoot lunch. 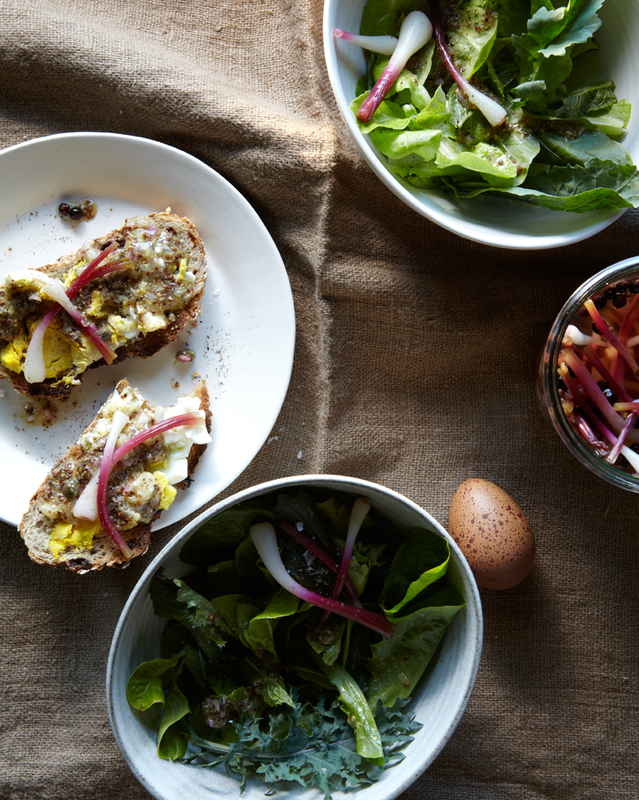 Farmer's market salad greens and organic hard boild eggs smashed on toasts with pickled ramps and the most AMAZING lemon caper dressing from April Bloomfield via food 52. Basically, anything is a vehicle for this dressing. It is just that good and that addictive. really. try it. ceramics in the below shots are from a beautiful new shop in Williamsburg called MOCIUN. Mociun, 224 Wythe Avenue, at North 4th Street, Williamsburg (718-387-3731 or mociun.com).